Apple was founded by Steve Jobs, Steve Wozniak, and Ronald Wayne in April 1976 to develop and sell Wozniak's Apple I personal computer. It was incorporated as Apple Computer, Inc. in January 1977, and sales of its computers, including the Apple II, saw significant momentum and revenue growth for the company. Within a few years, Jobs and Wozniak had hired a staff of computer designers and had a production line. Apple went public in 1980 to instant financial success. 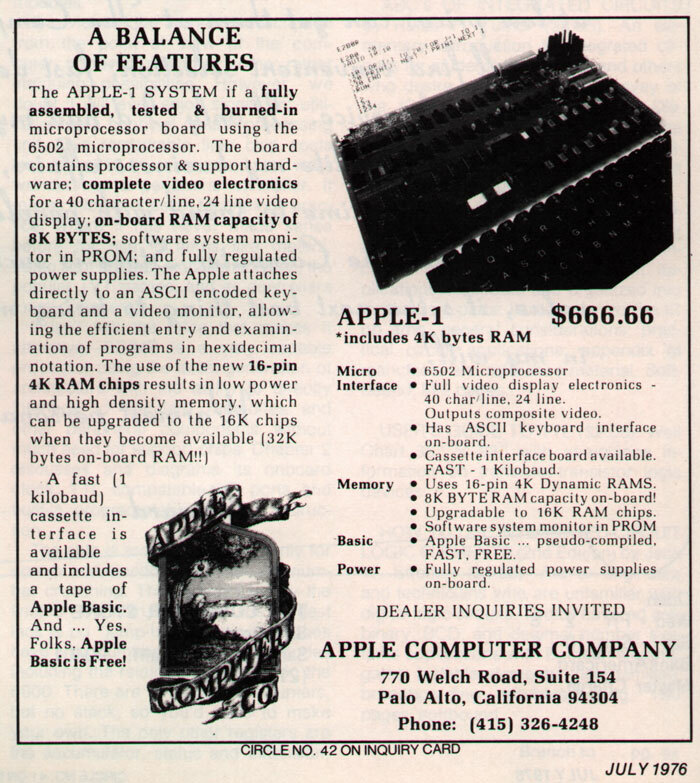 Over the next few years, Apple shipped new computers featuring innovative graphical user interfaces, such as the original Macintosh in 1984, and Apple's marketing commercials for its products received widespread critical acclaim. However, the high price tag of its products and limited software titles caused problems, as did power struggles between executives at the company. In 1985, Wozniak stepped away from Apple and Jobs resigned entirely, bringing other Apple employees with him and creating his own company that same year—NeXT. As the market for personal computers increased, Apple's computers saw diminishing sales due to lower-priced products from competitors, in particular, those offered with the Microsoft Windows operating system. More executive job shuffles happened at Apple until then-CEO Gil Amelio in 1997 decided to buy NeXT to bring Jobs back. Jobs regained leadership within the company and became the new CEO shortly after. He began a process to rebuild Apple's status, which included opening Apple's own retail stores in 2001, making numerous acquisitions of software companies to create a portfolio of software titles, and changing some of the hardware used in its computers. It again saw success and returned to profitability. In January 2007, Jobs announced that Apple Computer, Inc. would be renamed Apple Inc. to reflect its shifted focus toward consumer electronics. He also announced the iPhone, which saw critical acclaim and significant financial success. In August 2011, Jobs resigned as CEO due to health complications, and Tim Cook became the new CEO. Two months later, Jobs died, marking the end of an era for the company. In June 2017, Apple announced the HomePod, its smart speaker aimed to compete against Sonos and Amazon Echo. Towards the end of the year, TechCrunch reported that Apple was acquiring Shazam, a company specializing in music, TV, film and advertising recognition. The acquisition was confirmed a few days later, reportedly costing Apple $400 million, with media reports noting that the purchase looked like a move by Apple to get data and tools to bolster its Apple Music streaming service. On June 5, 2018, Apple deprecated OpenGL across all OSes and urges developers to use Metal as the alternative. On September 12, 2017, Apple introduced Apple Watch Series 3 featuring LTE cellular connectivity, giving the wearable independence from an iPhone except for the setup process. ↑ "Times of India Article on discussing addition of 500 jobs". AFP. Retrieved April 21, 2012. ↑ Donato-Weinstein, Nathan (December 14, 2015). "Exclusive: Apple buys former chip fab in North San Jose". Silicon Valley Business Journals. Advance Publications. Retrieved June 30, 2017. ↑ Dilger, Daniel Eran (December 14, 2015). "Apple buys former Maxim chip fab in North San Jose, neighboring Samsung Semiconductor". AppleInsider. Retrieved June 30, 2017. 1 2 "Apple to Open 25 Retail Stores in 2001" (Press release). Apple. May 15, 2001. Retrieved May 27, 2017. 1 2 3 "Apple Stores". MacRumors. Retrieved May 27, 2017. ↑ Fiegerman, Seth (May 16, 2014). "The Slow Evolution of Apple's Online Store". Mashable. Retrieved May 27, 2017. 1 2 Useem, Jerry (March 8, 2007). "Apple: America's best retailer". Fortune. Time Inc. Retrieved May 27, 2017. ↑ "Store List". Apple Retail. Apple Inc. Retrieved December 5, 2017. 1 2 3 4 Segal, David (June 23, 2012). "Apple's Retail Army, Long on Loyalty but Short on Pay". The New York Times. Retrieved May 27, 2017. ↑ Webb, Alex (May 19, 2016). "Inside the New Apple Retail Store Design". Bloomberg L.P. Retrieved April 26, 2017. ↑ Statt, Nick (May 19, 2016). "Apple just revealed the future of its retail stores". The Verge. Retrieved May 27, 2017. ↑ Hartmans, Avery (August 19, 2016). "Apple's retail boss wants Apple stores to resemble 'town squares'". Business Insider. Retrieved May 27, 2017. ↑ "Angela Ahrendts talks Apple store makeover, why Tim Cook hired her". CBS This Morning. CBS. April 25, 2017. Retrieved May 27, 2017. ↑ Rossignol, Joe (August 19, 2016). "Apple Opening Three Next-Generation Stores Over the Next Week". MacRumors. Retrieved May 27, 2017. ↑ Rossignol, Joe (February 6, 2017). "Apple Retail Update: Danbury Store Closes for Next-Generation Redesign, Dubai to Get Second Store". MacRumors. Retrieved May 27, 2017. ↑ Panzarino, Matthew (April 19, 2012). "Apple out to patent curved glass panels used in Shanghai Retail Store". The Next Web. Retrieved May 27, 2017. ↑ Simpson, Stephen D. (October 8, 2012). "How Apple's fortunes affect other stocks". The Globe and Mail. The Woodbridge Company. Retrieved May 27, 2017. ↑ Crothers, Brooke (March 29, 2012). "Is Best Buy following CompUSA, Circuit City to certain doom?". CNET. Retrieved May 27, 2017. ↑ Edwards, Jim (May 28, 2016). "NEVER MIND THE DEATH THREATS: An Apple Store worker tells us what it's really like working for Apple". Business Insider. Retrieved May 27, 2017. ↑ Leswing, Kif (October 27, 2016). "Apple added only 6,000 people last year — its slowest growth since 2009". Business Insider. Retrieved May 29, 2017. ↑ "BRIEF-Apple says had 123,000 full-time employees as of Sept. 30". Reuters. November 3, 2017. Retrieved November 9, 2017. ↑ Turton, William (June 20, 2017). "Leaked recording: Inside Apple's global war on leakers". The Outline. Retrieved June 20, 2017. ↑ Deahl, Dani (June 20, 2017). "Internal Apple presentation on how to handle leaks gets leaked". The Verge. Retrieved June 20, 2017. ↑ Mayo, Benjamin (June 20, 2017). "Report details Apple's efforts to increase product secrecy, more leaks from Apple campus than supply chain in 2016". 9to5Mac. Retrieved June 20, 2017. ↑ Lovejoy, Ben (December 6, 2017). "Facebook named Glassdoor's 'best place to work' as Apple falls 48 places to #84". 9to5Mac. Retrieved December 14, 2017. ↑ Rossignol, Joe (December 6, 2017). "Apple Plummets to Lowest Ranking Ever in Glassdoor's Annual List of Best Places to Work". MacRumors. Retrieved December 14, 2017. ↑ Mickle, Tripp (June 7, 2017). "'I'm Not Sure I Understand'—How Apple's Siri Lost Her Mojo". The Wall Street Journal. Dow Jones & Company. Retrieved December 14, 2017. ↑ Hardwick, Tim (June 8, 2017). "Apple's Concern With User Privacy Reportedly Stifling Siri Development". MacRumors. Retrieved December 14, 2017. ↑ Greenberg, Andy (November 28, 2017). "Anyone can hack macOS High Sierra just by typing "root"". Wired. Retrieved December 5, 2017. ↑ Welch, Chris (November 28, 2017). "Major Apple security flaw grants admin access on macOS High Sierra without password". The Verge. Vox Media. Retrieved December 5, 2017. ↑ Rossignol, Joe (November 29, 2017). "Apple Releases macOS High Sierra Security Update to Fix Root Password Vulnerability". MacRumors. Retrieved December 5, 2017. ↑ Welch, Chris (November 29, 2017). "Apple releases update to fix critical macOS High Sierra security issue". The Verge. Vox Media. Retrieved December 5, 2017. ↑ Greenberg, Andy (December 1, 2017). "macOS update accidentally undoes Apple's "root" bug patch". Wired. Retrieved December 5, 2017. ↑ Clover, Juli (December 1, 2017). "Date Bug in iOS 11.1.2 Causing Crash Loop on iPhones as December 2 Hits [Updated]". MacRumors. Retrieved December 5, 2017. ↑ Ritchie, Rene (December 2, 2017). "iPhone crashing on Dec. 2? Here's the fix!". iMore. Mobile Nations. Retrieved December 5, 2017. ↑ Dillet, Romain (December 2, 2017). "Apple releases iOS 11.2 with 'I.T' autocorrect fix, faster wireless charging and Apple Pay Cash". TechCrunch. Oath Inc. Retrieved December 5, 2017. ↑ Lawler, Richard (December 2, 2017). "Apple releases iOS 11.2 with Apple Pay Cash and a bug fix". Engadget. Oath Inc. Retrieved December 5, 2017. 1 2 Warren, Tom (December 2, 2017). "Apple's had a shockingly bad week of software problems". The Verge. Vox Media. Retrieved December 5, 2017. ↑ Heater, Brian (December 4, 2017). "Apple Pay Cash starts rolling out to iPhone users in the US". TechCrunch. Oath Inc. Retrieved December 5, 2017. ↑ Gartenberg, Chaim (December 4, 2017). "Apple Pay Cash is rolling out for iOS 11.2 users". The Verge. Vox Media. Retrieved December 5, 2017. 1 2 Kingsley-Hughes, Adrian (December 4, 2017). "Something is rotten at Apple". ZDNet. CBS Interactive. Retrieved December 5, 2017. ↑ "Ruthlessness and lasers: Apple's supply chain revealed". Business.financialpost.com. Retrieved December 24, 2011. ↑ Lunden, Ingrid (July 24, 2012). "Apple's Feeling Europe's Economic Crisis: 'Essentially Flat' Sales And A 'Slowdown' In Business, Says Cook". TechCrunch. AOL. Retrieved May 24, 2017. ↑ "Apple CEO Tim Cook: 'I love India, but...'". Gadgets360. NDTV. July 25, 2012. Retrieved May 24, 2017. ↑ Mukherjee, Writankar (October 4, 2013). "Apple to enter smaller Indian towns with iPhones, iPads". The Economic Times. The Times Group. Retrieved May 24, 2017. ↑ Hong, Kaylene (July 24, 2013). "iPhone sales surge 400% YoY in India, with iPad sales on the rise too, says Apple CEO Tim Cook". The Next Web. Retrieved May 24, 2017. ↑ "Apple plans to sell used iPhones in India". Gadgets Now. The Times of India. March 4, 2016. Retrieved May 24, 2017. ↑ Broussard, Mitchel (March 4, 2016). "Apple Submits Application to Sell Used iPhones in India". MacRumors. Retrieved May 24, 2017. ↑ Rai, Saritha (May 3, 2016). "Apple's Plan for Refurbished iPhones Is Rejected in India". Bloomberg Technology. Bloomberg L.P. Retrieved May 24, 2017. ↑ Carman, Ashley (May 3, 2016). "Apple blocked from selling used iPhones in India". The Verge. Retrieved May 24, 2017. ↑ "Apple Opens Development Office in Hyderabad" (Press release). Apple Inc. Retrieved October 18, 2017. ↑ Rai, Saritha (May 17, 2016). "Apple CEO Makes First India Trip With Billion Phone Sales at Stake". Bloomberg Technology. Bloomberg L.P. Retrieved May 24, 2017. ↑ Byford, Sam (May 18, 2016). "Apple announces app development accelerator in Bangalore, India". The Verge. Retrieved May 24, 2017. ↑ Russell, Jon (May 17, 2016). "Apple is opening an app design and development accelerator in India". TechCrunch. AOL. Retrieved May 24, 2017. ↑ Rai, Saritha (February 6, 2017). "Apple Said to Revive Efforts to Sell Used iPhones in India". Bloomberg Technology. Bloomberg L.P. Retrieved May 24, 2017. ↑ Reisinger, Don (February 6, 2017). "Apple Is Trying Again to Sell Used iPhones in India". Fortune. Time Inc. Retrieved May 24, 2017. ↑ Srivastava, Shruti; Jagtiani, Sunil; Narayan, Adi (February 7, 2016). "Apple Said to Be on Course for Approval to Open India Stores". Bloomberg Technology. Bloomberg L.P. Retrieved May 24, 2017. ↑ Broussard, Mitchel (February 8, 2016). "Apple Close to Approval for Opening Retail Locations in India". MacRumors. Retrieved May 24, 2017. ↑ Roy, Rajesh; Purnell, Newley (March 23, 2017). "Apple to Start Making iPhones in India Over Next Two Months". The Wall Street Journal. Retrieved May 24, 2017. ↑ Gartenberg, Chaim (March 23, 2017). "Apple reportedly to start manufacturing iPhones in India". The Verge. Retrieved May 24, 2017. ↑ Roy, Rajesh; Purnell, Newley; Mickle, Tripp (May 17, 2017). "Apple Assembles First iPhones in India". The Wall Street Journal. Retrieved May 24, 2017. ↑ Mayo, Benjamin (May 17, 2017). "Apple has started production of iPhone SE in India, shipping to customers later in May". 9to5Mac. Retrieved May 24, 2017. ↑ Haselton, Todd (May 17, 2017). "Apple begins manufacturing iPhone SE in India". CNBC. NBCUniversal News Group. Retrieved May 24, 2017. ↑ Kalra, Aditya; Miglani, Sanjeev (December 11, 2017). "Apple, India wrangle over import tax on mobile parts: sources". Reuters. Retrieved December 13, 2017. ↑ Lovejoy, Ben (December 11, 2017). "Indian government likely to reject Apple's request to delay new import taxes". 9to5Mac. Retrieved December 13, 2017. ↑ Lovejoy, Ben (December 15, 2017). "India hikes tax on mobile phone imports in a move which will hurt Apple most". 9to5Mac. Retrieved December 16, 2017. ↑ Statt, Nick (May 3, 2017). "Tim Cook says Apple is investing $1 billion in US manufacturing". The Verge. Vox Media. Retrieved December 14, 2017. ↑ Ochs, Susie (May 3, 2017). "Apple joins 'Made in America' trend with $1 billion fund to promote U.S. manufacturing". Macworld. International Data Group. Retrieved December 14, 2017. ↑ Gartenberg, Chaim (May 12, 2017). "Apple's first target for its $1 billion US manufacturing fund is glass supplier Corning". The Verge. Vox Media. Retrieved December 14, 2017. ↑ Heater, Brian (May 12, 2017). "Gorilla Glass maker Corning gets $200 million from Apple's US manufacturing investment fund". TechCrunch. Oath Inc. Retrieved December 14, 2017. ↑ Salinas, Sara (December 13, 2017). "Apple has a $1 billion fund for US manufacturers, but it's ready to spend more, says COO Jeff Williams". CNBC. NBCUniversal News Group. Retrieved December 14, 2017. ↑ Miller, Chance (December 13, 2017). "Jeff Williams says Apple is prepared to invest more than $1B in US manufacturers". 9to5Mac. Retrieved December 14, 2017. ↑ Dean, Jason (August 11, 2007). "The Forbidden City of Terry Gou". The Wall Street Journal. ↑ Johnson, Joel (November 2, 2010). "Where the Workers Who Made Your iPhone Sleep at Night". Wired. Archived from the original on November 4, 2010. Retrieved November 13, 2010. ↑ Jason Dean (May 27, 2010). "Suicides Spark Inquiries". The Wall Street Journal. Retrieved May 29, 2010. 1 2 William Foreman (May 26, 2010). "Tech: Apple Supplier Foxconn Suffers 10th Death This Year, Asks Workers To Sign Anti-Suicide Pledge". The Huffington Post. Retrieved December 20, 2014. 1 2 "Apple under fire again for working conditions at Chinese factories". The Guardian. December 19, 2014. Retrieved March 23, 2017. ↑ "Suicides at Foxconn: Light and death". The Economist. May 27, 2010. Retrieved April 24, 2012. ↑ Žižek, Slavoj; Horvat, Srećko (2014). What Does Europe Want? : The Union and Its Discontents. Columbia University Press. p. xxi. ISBN 978-0231171076. ↑ "Climate Counts scorecard". Climatecounts.org. Archived from the original on January 4, 2009. Retrieved October 7, 2011. ↑ "ClickClean". Click Clean. Retrieved April 28, 2016. ↑ "Environment". Apple. Retrieved May 26, 2016. ↑ "Environment – Climate Change". Why we measure our carbon footprint so rigorously. Apple Inc. March 2016. Retrieved March 27, 2016. ↑ "Apple Environmental Responsibility Report 2016 Progress Report, Covering Fiscal Year 2015" (PDF). Apple Inc.
↑ "Watch the Apple Special Event". Apple. Retrieved March 30, 2016. ↑ Sumra, Husain. "Supplier Lens Technology Commits to 100 Percent Renewable Energy for Apple Manufacturing". Retrieved August 17, 2016. ↑ "Apple Announces Environmental Progress in China & Applauds Supplier Commitment to Clean Energy" (Press release). Apple Inc. August 17, 2016. Retrieved August 17, 2016. ↑ Slivka, Eric (November 9, 2011). "Apple Jumps to Fourth in Greenpeace's Environmental Rankings of Electronics Companies". MacRumors. Retrieved April 18, 2017. ↑ "Apple ranks fourth on Greenpeace's 'Guide to Greener Electronics'". AppleInsider. November 9, 2011. Retrieved April 18, 2017. ↑ "Apple, 4th position, 4.6/10" (PDF). Greenpeace. Retrieved April 18, 2017. ↑ "Environment – Reports". Apple Inc. Retrieved May 28, 2016. ↑ Chen, Liyan (May 11, 2015). "The World's Largest Tech Companies: Apple Beats Samsung, Microsoft, Google". Forbes. Retrieved May 24, 2017. ↑ "IDC: Smartphone shipments down 6.3% in Q4 2017, Apple overtakes Samsung for top spot". VentureBeat. 2018-02-02. Retrieved 2018-03-10. ↑ "Apple Passes Samsung to Capture the Top Position in the Worldwide Smartphone Market While Overall Shipments Decline 6.3% in the Fourth Quarter, According to IDC". www.idc.com. Retrieved 2018-03-10. ↑ Nuttall, Chris (December 29, 2011). "Apple in race to keep ahead in 2012". Financial Times. ↑ La Monica, Paul R. (July 22, 2015). "Apple has $203 billion in cash. Why?". CNNMoney. Archived from the original on August 18, 2015. Retrieved September 28, 2015. ↑ Farivar, Cyrus (July 13, 2015). "Apple makes 92 percent of all smartphone profits". Ars Technica. Retrieved March 23, 2017. ↑ Mickle, Tripp (April 30, 2017). "Apple's Cash Hoard Set to Top $250 Billion". The Wall Street Journal. Retrieved May 24, 2017. ↑ Wang, Christine (May 2, 2017). "Apple's cash hoard swells to record $256.8 billion". CNBC. Retrieved May 24, 2017. ↑ Duhigg, Charles; Kocieniewski, David (April 28, 2012). "How Apple Sidesteps Billions in Taxes". The New York Times. Retrieved April 29, 2012. ↑ "Investor Relations". Apple Inc. Retrieved April 28, 2016. ↑ "Apple Earnings Call". Apple Inc. Retrieved April 28, 2016. ↑ "National Income and Expenditure Annual Results 2015". Central Statistics. 12 July 2016. ↑ Taylor, Cliff (2 September 2016). "Apple's Irish company structure key to EU tax finding". The Irish Times. Retrieved 14 November 2016. ↑ "Statement by Commissioner Vestager on state aid decision that Ireland's tax benefits for Apple were illegal" (Press release). European Commission. August 30, 2016. Retrieved September 2, 2016. ↑ "Amazon 'pays less tax than sausage stall'". BBC News. September 2, 2016. Retrieved September 3, 2016. ↑ Beesley, Arthur (April 24, 2018). "Apple to start paying €13bn to Ireland over back tax claim". Financial Times. Retrieved 2018-05-05. ↑ "FORM 10-Q" (PDF). shareholder.com. Retrieved August 6, 2018. ↑ "AAPL Major Holders | Insider Transactions | Apple Inc. Stock – Yahoo Finance". finance.yahoo.com. Retrieved March 5, 2017. ↑ "Federal Court Cases Involving Apple, Inc". Docket Alarm, Inc. Retrieved May 10, 2014. ↑ Mullin, Joe (January 26, 2016). "Patent troll VirnetX wants jury to give it a half-billion dollars of Apple's cash". Ars Technica. Retrieved March 23, 2017. ↑ Novet, Jordan (December 21, 2016). "Nokia sues Apple for patent infringement in the U.S. and Germany". VentureBeat. Retrieved March 23, 2017. ↑ Swartz, Jon (December 21, 2016). "Nokia sues Apple for patent infringement". USA Today. Retrieved March 23, 2017. ↑ Orlowski, Andrew (November 15, 2017). "US trade cops agree to investigate Apple's 'embrace and extend'". Retrieved November 16, 2017. ↑ Vincent, James (June 13, 2016). "Apple promises to deliver AI smarts without sacrificing your privacy". The Verge. Vox Media. Retrieved December 9, 2017. ↑ Heisler, Yoni (May 22, 2017). "Apple is expertly trolling Android users with its new iPhone ads". BGR. Penske Media Corporation. Retrieved December 9, 2017. ↑ Greenberg, Andy (June 8, 2015). "Apple's latest selling point: how little it knows about you". Wired. Retrieved December 9, 2017. ↑ Farivar, Cyrus (September 18, 2014). "Apple expands data encryption under iOS 8, making handover to cops moot". Ars Technica. Retrieved December 9, 2017. ↑ Hall, Zac (November 16, 2017). "Apple details how it performs on-device facial detection in latest machine learning journal entry". 9to5Mac. Retrieved December 9, 2017. ↑ Greenberg, Andy (June 13, 2016). "Apple's 'differential privacy' is about collecting your data - but not your data". Wired. Retrieved December 9, 2017. ↑ Rossignol, Joe (December 6, 2017). "Here's How Apple Improves the iOS and Mac User Experience While Protecting Your Privacy". MacRumors. Retrieved December 9, 2017. ↑ Pagliery, Jose (February 22, 2016). "Apple promises privacy - but not on iCloud". CNN. Retrieved December 13, 2017. ↑ Cunningham, Andrew (February 24, 2016). "The case for using iTunes, not iCloud, to back up your iPhone". Ars Technica. Condé Nast]]. Retrieved December 13, 2017. ↑ Robertson, Adi (September 12, 2017). "Why Face ID won't give you the legal protection of a passcode". The Verge. Vox Media. Retrieved December 13, 2017. ↑ D'Orazio, Dante (November 23, 2014). "Apple partners with app developers for major Product RED fundraising effort". The Verge. Retrieved April 18, 2017. ↑ Chmielewski, Dawn (December 17, 2014). "Apple's Holiday Product Red Campaign Raises $20 Million for AIDS Research". Recode. Retrieved April 18, 2017. ↑ Clover, Juli (December 17, 2014). "Apple's (Product) RED Holiday Campaign Raised $20 Million to Fight AIDS". MacRumors. Retrieved April 18, 2017. ↑ Miller, Chance (March 21, 2017). "Apple officially announces (RED) iPhone 7 & 7 Plus, updated iPhone SE with double the storage". 9to5Mac. Retrieved April 18, 2017. ↑ Warren, Tom (March 21, 2017). "Apple launches red iPhone 7". The Verge. Retrieved April 18, 2017. ↑ Weintraub, Seth (November 9, 2011). "Apple donates $2.5M to Hurricane Sandy relief". 9to5Mac. Retrieved November 18, 2012. ↑ "Apple donates $5M to Hand in Hand Hurricane Irma/Harvey relief, sets up iTunes donations". 9to5Mac. September 8, 2017. Retrieved December 13, 2017. ↑ Miller, Chance (September 21, 2017). "Tim Cook says Apple is donating $1 million to earthquake recovery efforts in Mexico". 9to5Mac. Retrieved December 13, 2017. ↑ Weintraub, Seth (January 14, 2010). "Apple sets up Haiti donation page in iTunes". 9to5Mac. Retrieved December 13, 2017. ↑ Gurman, Mark (March 12, 2011). "Apple now taking Red Cross donations through iTunes for Japan relief fund". 9to5Mac. Retrieved December 13, 2017. ↑ Lovejoy, Ben (November 12, 2013). "Apple invites donations to American Red Cross to support Philippine typhoon relief". 9to5Mac. Retrieved December 13, 2017. ↑ Lovejoy, Ben (September 18, 2015). "Apple invites Red Cross donations through iTunes to help the Mediterranean refugee crisis [Updated]". 9to5Mac. Retrieved December 13, 2017. ↑ Miller, Chance (August 27, 2017). "Apple now accepting donations via iTunes for Hurricane Harvey relief efforts". 9to5Mac. Retrieved December 13, 2017. ↑ "Help the planet. One app at a time". World Wildlife Fund. Retrieved April 14, 2016. ↑ "Environment". Apple Inc. Retrieved April 14, 2016. ↑ "Global Apps for Earth campaign with WWF raises more than $8M" (Press release). Apple Inc. Retrieved June 18, 2016. ↑ "Mergers & Acquisitions". aaplinvestors.net. Retrieved December 11, 2016. ↑ Flores, Marc, Over 5000 apps stricken from the Apple app store, new rules in place, MobileCrunch, February 20, 2010.